Adjustable DC power supplies are capable of delivering a variable output voltage or current. These adjustable power supplies fall into three categories: locally adjustable power supplies, remotely adjustable power supplies, and programmable power supplies. Locally adjustable power supplies can be adjusted through a built-in potentiometer, remotely adjustable power supplies can be adjusted through a remotely located potentiometer, and programmable power supplies can be of the analog type with a remote voltage source for adjustment, or digitally adjustable through RS232, USB, or Ethernet communications. 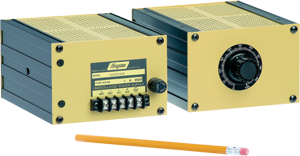 Acopian manufactures several DC power supply models that are adjustable. Our Low Profile Switchers are capable of 0-5VDC and 0-10VDC remote analog programming, and also can be adjusted using built-in potentiometers. Our 1U Switchers are capable of remote analog programming, adjustment using built-in potentiometers, or digitally programmed through RS232, USB, and Ethernet communications. 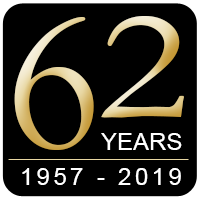 Our special systems using our Gold Box Infinity Linear Regulated Power Supplies or our Low Profile Switcher models can be equipped with local potentiometer adjustability, analog voltage programming or RS232, USB, and Ethernet interfaces. Why use an adjustable DC power supply? More and more systems that use power supplies are becoming computer controlled. Using an adjustable / programmable power supply allows digital or analog control of the power supply output by a control system for maximum versatility. The control system can control and monitor the power supply output voltage and current from virtually anywhere there is an Ethernet connection. Thus, plant-wide automation parameters can be monitored by one central computer, and process variables can be adjusted to maximize production and quality. All Acopian programmable power supplies have local adjustment pots mounted in the power supply (Gold Box Infinity use suffix C2). In the event of an interface failure, the operator can revert to manual control with the addition of a simple jumper(s). What is the adjustment range of Acopian’s wide adjust output power supplies? All Acopian Wide Adjust Output power supplies are fully adjustable from 0V to full rated output voltage. This is regardless of whether you are using the internal potentiometers, remote analog programming, or remote digital programming.